Many atheists celebrate their favorite secular aspects of Christmas. Others prefer to replace Christmas with one of many recently proposed secular alternatives. Still others prefer to skip Christmas and have little need to replace it with anything. I'm in this last group; however, if I decided that I really needed to celebrate a winter holiday for some reason, I think Festivus would be tough to beat. It reminds me of one of my favorite TV shows of all time and involves wonderful traditions like angrily telling those around you how much they have disappointed you. And the traditional Festivus pole is certainly easier to set up and store than a tree. What's not to like? 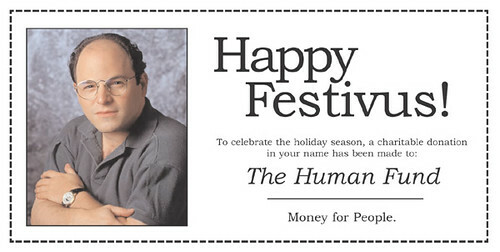 To those of you who will be celebrating it this year, I wish you a happy Festivus. I think it is great that such a brilliant bit of comedy writing has spawned a set of holiday traditions with as much legitimacy as some of the more popular ones.